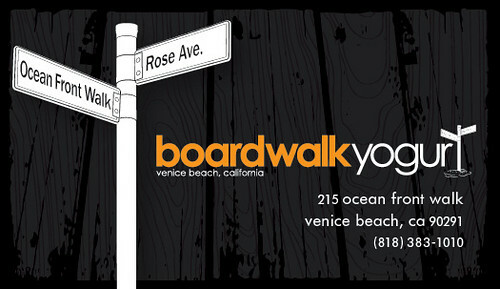 Boardwalk Yogurt Venice Beach - Yo! Venice! Boardwalk Yogurt will be opening “soon” at 215 Ocean Front Walk. Boardwalk Yogurt says it will be “self serve yogurt on the beach – 10 flavors / 50+ toppings to choose from – as little or as much as you want… We only use frozen yogurt with one of the highest counts of beneficial live natural yogurt cultures which when present in the intestinal tract of the human body help to ensure the proper balance needed for digestion and good health.